Ma$ter$ of War or Non Cent$? The benefit of being a blogger and free-lance writer is that I don’t have to come up with different projects for every cap. What follows is preliminary research for my next book about battle at 400 AD. These will likely undergo further revision, though, as you’ll see, there is still plenty to debate about Tikal in 378 so I will disagree with somebody no matter what the final form looks like. For a brief primer I would the this page, especially rulers 14-16. For its place in apologetics you might consult this article. The first part of this post examines pre battle insults, the second part examines the impact of new technology on Mayan warfare and some of the changes to Tikal’s army that remains unexamined by most scholars, and the last part summarizes the highly speculative analysis surrounding issues with Tikal, before offering a few thoughts on apologetic arguments. Tikal 378 AD is a pivotal year for Tikal. In Mormon circles it supports the idea of a militaristic influence and expansionist warfare that could decimate entire cities. Fire is Born arrived in the city of Tikal on Janurary 16th 378 on the same day the previous king, Jaguar Paw died. He amassed the forces of Tikal to fight their rivals at Uaxactun. In the decisive victory for Tikal they conquered their neighbors, introduced a new form of warfare, and left some very ambiguous questions in the process, many of which can be aided by the use of military history. For the sake of length I will not summarize the battle in great deal, though you might enjoy reading the dramatic recreation in The Forest of Kings, though that recreation could use the hand of a dedicated military historian. The most glaring case occurred when Linda Schele and David Friedel suggested that the Mesoamerican battlefield included ritualistic pre-battle insults. These activities followed an “honorable precedent,” as far as the written sources say, that went back 20 katuns (about 400 years) or more. Yet a study of historical battlefields finds these behaviors unrealistic. Real-life battles, even in the early stages of the conflict, were a confused melee of screaming warriors bellowing battle cries; commanders attempting to shout orders; battle drums, gongs, trumpets, or cymbals; the braying of pack animals or cavalry horses; and the pounding of one’s own heart. This noise had to be processed or understood by those likely wearing helmets or head gear that limited hearing. The records describing the battle of Tikal don’t mention all or many of these specific things, but logic insists that battle amongst thousands of people would be a noisy affair — and the early battle sounds would be quickly added to by thousands of clashing weapons and the screams of the wounded and dying. Moreover, the rush of adrenaline triggers physical reactions that make battle notoriously difficult to understand for those participating in it. Based on the analysis of the chaotic and loud battlefield then, Schele and Freidel’s recreation of Mayan battle fails to take into account the impractical nature of trying to understand each other during this kind of physical stress on a chaotic battlefield. As other historians have suggested when examining pre-battle insults, this honorable tradition is more likely a stylized recreation of the account embellished long after the battle rather than a realistic recreation of events. The battle between Tikal and Uaxactun did include some verbal chanting, but instead of ritual communication between groups it was far more likely they were prearranged outbursts with some elements of spontaneity to strengthen the shouter’s morale and that of nearby comrades. My next book focuses on the connection between armies and the society that creates them. This is especially important in considering why the Battle of Tikal in 378 was so important. After the embellished account of pre battle ritual insulting the two sides clashed. According to the most detailed account of the battle, initially the forces of Uaxactun pushed back Tikal’s military. The sides then separated, and that’s when Tikal forces debouched from the tall grass flanking the enemy army. Armed with hunting weapons like the spear thrower (atatl) and green obsidian tipped blows darts, apparently the first time adapted to the lowland battlefield, they had a devastating effect that killed the best warriors of Uaxactun, and drove the enemy army back to their capital. These changes had several implications about the changing nature of warfare that simply focusing on glyphs would fail to assess. Generally, the skill required of a weapon and form of combat limits the number of participants in that form of combat. Elite warriors and possible members of military orders, fighting another elite warrior required a certain amount of skill and training which in turn limited the amount of warriors an army could field. Ross Hassig showed in detail the complicated way that warriors faced off with other warriors. Even though it was Aztec warfare, the weaponry and goals are familiar enough to glean specific details about the skill and danger required in hand to hand combat among elites. For example, in striking their opponent, the obsidian tipped swords embedded in wood had a difficult time cutting through bone. Since the warriors aimed to capture, and the swords had difficulty with bones, they likely aimed for the fibula of the lower leg, which was thinner, likely covered by less armor, and happened to be the most broken bone found in ancient battles. (My daughter’s friend showed up to school in cast because she broke that bone falling off her scooter.) Yet even though it’s incredibly painful and would temporarily incapacitate an opponent, the captured enemy with a broken or damaged fibula could still walk back to meet his gruesome fate in the ball courts or pyramids. Yet instead of using a weapon that required training, expert parries and even targeted blows at a specific part of the body, the new weapons in this battle were so easy to use that the militia and commoners used them. The mass of elite infantry in front of them made relatively easy targets as well. The spear throwers and darts had greater range, accuracy, and penetrating power than regular throwing spears. This meant that Tikal could field a larger military with a smaller population in quicker time. They didn’t have to spend massive amounts of time and money training an elite military class (that their population probably couldn’t support anyway). Tikal could lose the first part of the battle where their warriors were pushed back, but win the second part because they massed an untrained population that could strike from a distance at an opportune moment. Long term, Tikal could likely rely on its militia of spear throwers to give them an edge in battle against their enemies. It’s unclear how long this advantage lasted and likely didn’t last for long. In the short term Fire is Born is attested by monuments at Uaxactun, on the monument to the new ruler of Tikal (see below), and in several other nearby cities. Tikal entered a long silence from the late 6th to late 7thcentury that suggests a period of subjugation and weakness. But it is a very generous inference to say that some spear throwers gave them a 200 year advantage. As a matter of survival other powers would quickly implement the new equipment and tactics unless two factors prohibited it: Some kind of cultural prohibition against it. But the Star War ideology and spear thrower iconography became a dominant feature of Classic Maya, so that is unlikely. Or it was technology that was remained a secret, but the spear throwers weren’t a secret, it was their aggressive and unexpected use that made the difference. In short, Tikal likely gained only a short term advantage from changing both weapons and tactics. The consequences of those changes- the larger military made possible by slightly different tactics as well as the additional prestige and income from their conquests, combined with the vigorous leadership of Fire is Born resulted in a roughly 40 year advantage. I’m pleased to add that after I wrote the above analysis George Cogwell wrote this and he seems to agree with my anlaysis: I see such success as results of new tactics and more discipline units, possibly new weapons such as atlatls, probably the demographic strength to put more men in the field [though he posits a larger army based on a larger population, not a large army based on simpler weapons and tactics as I argue]…[and] a few exceptionally skilled leaders. The failure to answer the question of technology implementation and the effects of the new battle weapons and tactics to change society fundamentally suggests the limits of sources in Mesoamerican studies. The glyphs on monuments are important keys to understanding and certainly better than nothing, but they are still incredibly limited. What follows are a summary of major hypothesis concerning key figures such as Owl Throwing Spear and Fire is Born, the extent of foreign intervention, and the relative use of military force in these events. They are intended to show the head spinning nature of all of these conflicting theories, are will then be contrasted with the supposed “speculative,” “weak,” or “fringe,” apologetic arguments using similar sources. First, even their pronunciations remain in flux. I’ve been using the name Fire is Born, but he was originally called Smoking Frog, and you can also call him Siyaj K’ak’, which many modern scholars prefer. (I’m a Chinese historian that hates the dashes and apostrophes of the Wade Giles system, so I gravitate towards names that keep me near the home keys.) Fire is Born is nominally recognized as the Tikal war chief but anything beyond that is debated. It’s not in doubt that Fire is Born won the battle and Tikal conquered Uaxactun. The story begins with his arrival on the same day as the previous king’s death. But its not even clear fire is Born physically arrived from somewhere else or was even a foreigner. The glyph describing the arrival of Fire is Born in Tikal could also mean that he is “of” or from Tikal. One author suggested that Fire is Born could also have been returning from a pilgrimage to Ho’ Noh Witz, which is assumed to be Teotihuacan, but could also be a place name of a different city or one that hasn’t been discovered yet. Alternatively a powerful king of Teotihuacan, a symbol, and a title, depending at turns on the monument and who you ask. One of the most contested terms is Spear Throwing Owl, a glyph that originated in Teotihuacan and is assume to refer to particularly powerful king that ruled from 364-439. Fire is Born could be Spear Throwing Owl’s war chief who arrived in Tikal the same day their last king, Jaguar Paw, died. There is no battle glyph so some suggest that the ruler simply died without an heir. Yet the snakes tail entering owl eyes glyph was a secondary phrase that meant violent conquest. This was added to the glyph for arrival in other cities such as Palenque which leaves open the possibility of a violent military event that killed Jaguar Paw (or Chak Tok Ich’aak). Curled Snout. He is notable for the spear thrower and square shield, both of which are militaristic and foreign images. Curled Snout (or First Crocodile, Yax Nuun Ahiin I), the new ruler of Tikal installed by Fire is Born, has been called the figurative son of Spear Throwing Owl (in a supposed bid to help commoners overlook the fact that he was not the son of a last king), and called the literal son of Spear Throwing Owl. Scholars further suggest that Fire is Born had Spear Throwing Owl as a kingly title, or as part of his name. Others point out that the iconography for Stormy Sky (Curled Snout’s son), that supposedly refers to Spear Throwing Owl, don’t include an owl or spear thrower, (they argue its another bird like an Eagle and just a shield) so it could refer to some kind of kingly title or influence from Teotihuacan. Schele and Friedel argued that Fire is Born was the brother of the last great king, Jaguar Paw. At the death of the previous king Fire is Born then appointed his nephew, Curled Snout as ruler of Tikal, and Fire is Born ruled Uaxactun as sort of an empire by family rule. Finally, “arrive” might also be a figurative sense and not refer to movement at all. Scholars postulate that Fire is Born was the head of a great house that overthrew the last king or gained power (and arrived in a sense) after his death. The limited reference to previous rulers and the martial iconography suggests a retrenchment and change in Tikal back to traditional iconography. This is not an Owl and only contains a shield, which leads to debate if this is a different way of saying the Spearthrowing Owl, or the something different. When I was an undergraduate I was told that history is more like Swiss cheese than we normally think. It is full of holes and historians use their sources to try and fill them. The holes for Mesoamerican history and this event in particular are bigger than most. When your head stopped spinning from the previous section you likely noticed the significant questions pertaining to the identity, role, origin, and accomplishments of pivotal figures in Mayan history, and interaction between various groups. If you had trouble following the previous section and all of the conflicting theories, its okay because that was my point. The analysis that tries to solve these problems is so speculative and based on so little data that there are wildly different theories that interpret them. After reading about the wildly different interpretations, analysis, and conclusions, as well as the obscure grammatical debates that come from a very small set of incomplete stelae, I am even more convinced that apologetic arguments, particularly those about Mesoamerica, are dismissed because of a prioribeliefs that historicity of the book is laughable, and not because the arguments are inherently weak. John Sorenson presented a case that place Book of Mormon people in history with Mormon’s Codex. Off the top of my head it includes the sudden absence of white sculptures in highland Guatemala, the two different building materials suggesting two different ethnic groups building a temple in Santa Rosa, the sudden building program around 75 BC in the same area, the volcanic eruptions around 50 AD, and the sudden depopulation of Chiapas in the early terminal classic followed by new and different settlements, are all arguments that take incomplete data, apply the same scholarly methods, and come up with conclusions just as strong as the argument Spear Throwing Owl is mentioned in a glyph that doesn’t contain either a spear thrower or an owl. This point is debatable, but if I adopted the same tactics as critics of apologists, I would say they are grasping at straws, demand more proof, claim the argument doesn’t really show anything, question the scholar’s credentials and character, and insist upon peer review for every minute point, but never actually say why the argument is wrong. Then I would copy and paste a list of objections to the argument from Wikipedia, call it a sincere letter, let it go viral and then become a professional copy and paster. As you might have guessed, I think more study of limited data is important, even if different conclusions are reached, I just wished critics would allow arguments in favor of a historical Book of Mormon the same courtesy. Linda Schele and David Freidel, A Forest of Kings: The Untold Story of the Ancient Maya (New York: William Morrow and Company, 1990), 151. Karl Friday, Samurai Warfare and the State in Early Medieval Japan, (New York: Routledge Press, 2004), 145–149. While modes of battle aren’t the same between Samurai and Mesoamerican peoples, the important points are the practice and effect of pre-battle insults, as well as the general chaotic nature of the pre-battle phase and the effect it had on participants. George Cogwell, “A Perspective From Outside the Maya Region,” in The Maya and Teotihuacan Geofrrey Braswell, ed. (University of Texas Press, 2003,) 331. Maria Ponce De Leon, “Problematic Deposits and the Problem of Interaction: The Material Culture of Tikal during the Early Classic Period” in The Maya and Teotihuacan Geofrrey Braswell, ed. (University of Texas Press, 2003,) 192. Ron Madson is a popular peace advocate and writes at the Mormon Worker. We’ve bumped into each other at conferences and each have dueling chapters in the same book. At the Mormon Worker he wrote a piece called Ma$ter$ of War. My eye was attracted to it because, and I swear, my first hope was this was some random post about the latest expansion to Lords of Water Deep, a cool ability in the Big Trouble in Little China table top game, or forgotten classic by Avalon Hill. Instead, it was a long argument against warfare. I invite you to clink the link on the Mormon Worker and read for yourself as I won’t quote much. But I will respond to the major arguments he made about the financial waste of war, and what seems like, upon initial inspection, a convincing moral case against war. The first major flaw concerns defense spending. 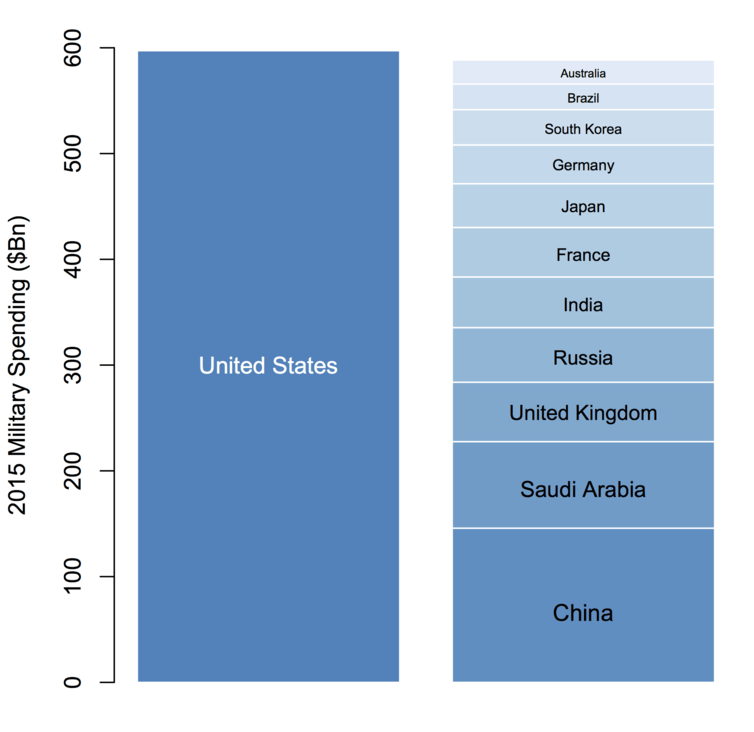 Madson offers an infographic that shows a giant bar graph of American defense spending, followed by the next 7 to 11 countries combined (depending on which chart is used.) Yet the problem is that many countries likely misreport their spending. Just with China there is considerable evidence of cooking the books. Sinologist June Teufel Dryer for example estimates that Chinese spending is much higher based on several factors. She points to complaints of province leaders feeding and housing soldiers to argue that the Chinese don’t report many of their personnel costs, such as housing and food. She argues that the cost of their nuclear weapons program, which is rather large, and the cost of their weapons acquisition programs are not included either. The low range of the reconfigured Chinese budget is 30-40% higher than what the Chinese report. The high range of estimates would place their budget as much as ten times higher. The median derived by most analysts suggests a military budget three to four times their disclosed amount. Using the amount China admits to (144 billion in military spending in 2015) and then multiplying by 4 (the amount that most analysts suggest) would place China roughly equal with the US in spending. And considering the low cost of living, that money can sustain a much larger military than it can in the United States. More importantly, Madson’s arguments assume that threats are simply a function of math. As though there is some sort of theme park cut out with his hand out that says, your spending must be this high in order to be safe. If that were the case then mathematicians and accountants would be the generals. More important than just the amount of money spent, is how the money is spent, the way soldiers and systems are deployed, and then the way they are led in combat. Both of these are necessary to counter a Chinese strategy that relies on hundreds and even thousands of missiles, some of which that can hit Guam. In the event of war China is expected to launch these missiles at key elements of U.S. expeditionary forces such as airfields, ports, logistics hubs, and carrier strike groups. Without the built in resiliency the US forces could be paralyzed and denied access to Taiwan, the South China Sea, or disputed islands around Japan. China would then have a free hand in seizing key territory in what they call the “first island chain.” If successful, by the time American forces recover from the missile barrage, China would have seized the territory they wanted, and could present the world with a fait accompli similar to Russia’s annexation of Crimea. Speaking of Russia, the geography of the Baltic members of NATO places the US in a similar problem of seizing key territory before America can properly respond. In extensive war games RAND concluded that Russia could field as many as 25 battalions within 10 days of the start of hostilities, compared to 17 for NATO. That doesn’t sound like an insurmountable difference, especially with NATO’s advantage in airpower. Using Madson’s logic then, we are wastefully spending more money than we need to. Except that current NATO forces are overwhelmingly light and would be overwhelmed by concentrated Russian artillery, missiles, and armored units. In the same war games analysts concluded that the Russians would capture Riga, the capital of Latvia, within 48-60 hours after invading. To counter this, analysts have suggested pre supplied and forward deployed heavy battalions in the region. The armored brigades don’t represent many more soldiers than are already deployed in the region, but they will provide the key elements that force Russian heavy units to slow their advance, get off roads, and concentrate for battle, and essentially make them better targets for NATO air power. I asked over a year ago if the current NATO brigades in the Baltics are just a speed bump, and without critical adjustments that largely don’t involve money, but just a repositioning of forces and systems already in the area, they will remain that way. This is getting a bit detailed, but I wanted to show the reader that matters of budget, strategy, and force structure matter just as much, if not more than simple screeds against spending money. The US faces real threats from a resurgent and aggressive China and Russia. Both of whom often cook the books to distort their massive military spending, and which have upgraded key forces such as missile technology that can stun the US into inaction through a massive surprise attack. So far, I’ve shown how numbers are not a simple measure of threat. Countries like China cook the books and allies cut their military budgets to spend on social programs, which both distort the relative amount of spending. But spending money takes away from valuable social programs that help lives when the military just take lives. According to Madsen, we’ve been terrorists nonstop since 9/11. There is significant debate about the efficacy of social programs and their solvency, and perhaps I’ll address that in another post, but here I want to discuss the misuse of the word terrorist, and offer a brief word concerning morality in warfare. I discussed this in far more detail back during the Bundy fiasco. But the short version is that terrorism is used far more for its pejorative and emotional value than its clinical description. Its very popular to repeat the cliché that one man’s terrorist is another man’s freedom fighter. In the sense that words themselves are weapons, this is entirely true. Various revolutionary groups, terrorists, and the governments that oppose them can use the terms to either bolster their position or undermine their opponents. Yet, despite the manipulation of words, and despite some of the disputes over the definition of terrorism, it’s still entirely possible to tell the difference between a freedom fighter and a terrorist. Items such as the donning of uniforms, discrimination between military and nonmilitary targets, discernment against or deliberate targeting of civilians, and declarations of war from recognized heads of state, makes it very easy to distinguish between George Washington and Abu Al Baghdadi. There is some overlap between insurgents and terrorism, but its not nearly so indistinguishable as the purveyors of the cliché would lead you to believe. Manson had a cult of personality that viciously and randomly stabbed people, including a pregnant women, while walking on the street. A soldier, wearing a uniform, in a constitutionally declared war is ordered into combat against other soldiers. This makes the morality of killing far different between the two. Even saying that, America rains death from above which is still horrible right? Yet killing a civilian by accident is different than deliberately targeting him or her. If they happen in the course of legitimate acts of war and the direct intention is a morally acceptable military target, then unintentionally killing civilians is within the realm of just war. That is still tragic and a horrible loss of life, but not a war crime or terrorism. The public could reasonably ask if the military should have been more cautious, and used better judgement (not to mention aim) during the situation. But the military already works hard to have precision weapons that only hit their intended target, they assess targets and before they bomb in built up urban areas (such as the recent Battle for Mosul) they assess potential civilian loss. Even after all of these precautions, civilian lives are lost which doesn’t make it terrorism. To make matters even more difficult, ISIS and other groups deliberately cloud the situation by militarizing nonmilitary targets such as hospitals and schools, and then trying to shield military targets with civilians. (The deaths of civilians in the latter case would be a war crime on the part of those using the human shields.) This complication makes it more than “the US is evil for killing civilians or bombing a hospital,” because bad actors deliberately muddle the distinctions between acceptable and unacceptable targets. Moreover, like the hands up, don’t shoot narrative, (which was the lie of the year,) the supposed victims of these air strikes wale to the nearest reporter with an often tendentious narrative, which is then tabulated by anti-American NGOs and repeated by people like Madson. In short, the context of fighting a war makes American actions legal, civilian losses are strenuously avoided, but often accidentally happen; despite being unintentional consequences of just warfare they are often exaggerated by American enemies to anti-American sources by the very people who criminally muddled the distinction between military and nonmilitary targets and put civilians in harm in the first place. 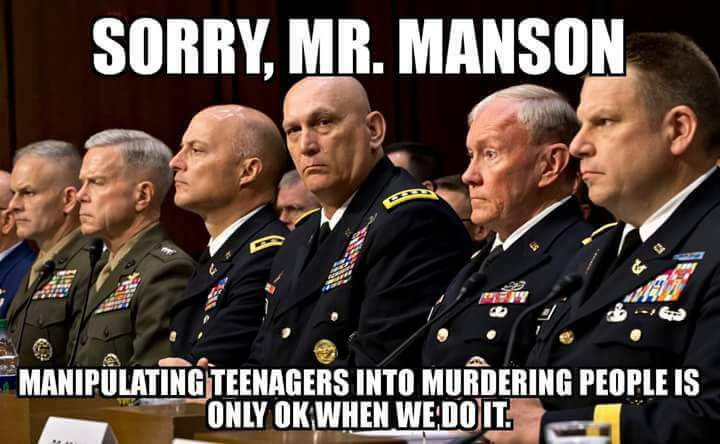 Madson magnifies rare American misdemeanors and ignores the frequent felonies from bad actors. I’ve provided a sober assessment of the American budget, disposition of forces, and morality of warfare (as well as my pet peeve when people misuse terrorism.) I did go into a bit of detail and couldn’t cover many other items. But I hoped that I showed that these are complex issues that deserve more than shrill moral condemnation. China and others cooks the books to make American military spending look overwhelming. Even if it was, money spent is not the entire sum of threats faced, but based on particular circumstances and the US faces real challenges. American forces fight justly within recognized rules of war and seek to avoid civilian casualties against a barbaric enemy that deliberately kills, rapes, and uses civilians as shields in pursuit of their savage world view. Instead of Master’s of War, his post is more like some $hoveling Non-cents. June Teufel Dryer, Recent Developments in the Chinese Military,” A Military History of China, David Graff, Robin Higham eds, (New York: Westview Press, 2002), 285-302. Michael Walzer, Just and Unjust Wars, 153-155.